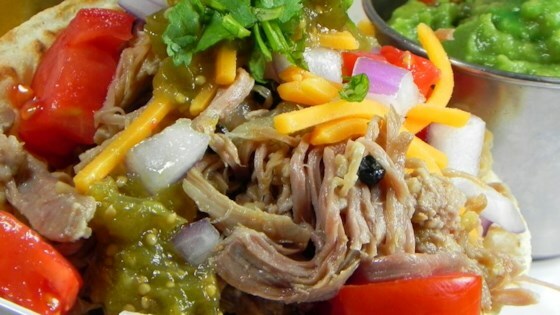 "This the easiest recipe for tasty carnitas. Once cooked, the meat can also be shredded and mixed with BBQ sauce for incredible pulled pork sandwiches, or pan fried in a little oil until crisp on the outside." Place the pork shoulder, oranges, onion, garlic, kosher salt, cumin, black peppercorns, and bay leaves into a large Dutch oven. Add water to cover. Bring to a boil over high heat, then reduce the heat to medium-low, and simmer for 10 minutes. Skim off any foam that rises to the top. Cover loosely, and simmer until the meat is tender, about 1 1/2 hours. Allow the pork to cool, covered, in the broth for 1 hour. Shred the meat with two forks. LOVED it!!! I used pork sirloin because that was what I had. Threw everything into the crock pot on low for 9 hours. Shredded beautifully. This is going to be a regular supper here!